A wreath is always a nice way to welcome guests and family into your home, and it also makes a lovely gift. While wreaths are traditionally Christmas decorations, they can also (with appropriate decoration) be used to welcome spring, celebrate fall, or even invite summer in. This wreath craft is super easy, can be made in as little as 30 minutes and is kid-friendly, requiring minimal parent supervision (only while using the hot glue gun). 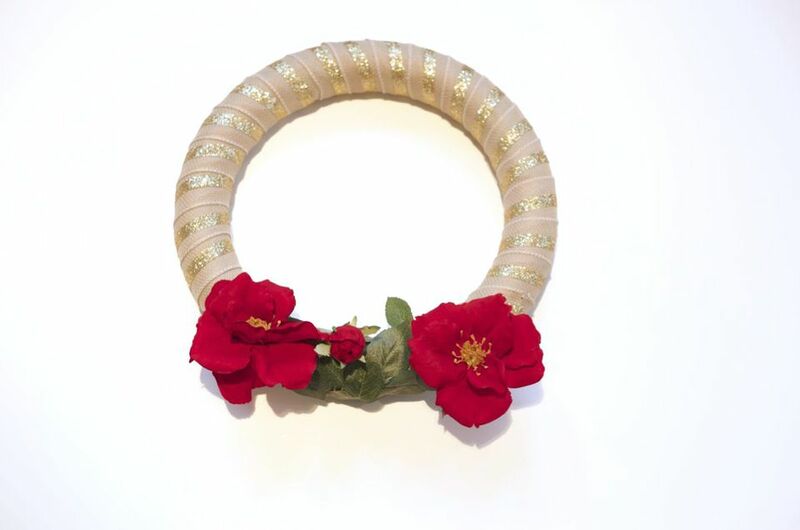 If you go with a neutral base ribbon, this wreath can be altered and updated for any holiday or season. You can skip this step if you are happy with your single ribbon choice and do not plan on adding an accent color to your base ribbon. Lay the base ribbon (the 2") flat on a surface; either a table or the floor works well. Use scissors to cut five yards of your base ribbon and accent ribbon. Line up your accent ribbon (the 5/8") with the middle of the base ribbon. Use a hot glue gun to attach the two ribbons together. Work slowly, gluing on the accent ribbon to make sure you keep it in the center of your base ribbon. Pick sides of your wreath form to be your front and back. Starting at the top of the back side, stick a glue dot to the form and attach the ribbon. Take one turn around the wreath form then add another glue dot to stick the ribbon down. Continue all the way around the wreath form or until you run out of ribbon. Using glue dots allows you to easily change the ribbon for different holidays as you see fit. Use scissors to cut the fake flowers from their stems. Position them first before gluing them on. Once you have decided where to place them, you can glue them down carefully onto the wreath form so as not to get hot glue on the flower petals. Cut leaves from the stem of the fake flowers with scissors. Position them decoratively around the fake flowers to fill in any gaps you may have or cover up any imperfections. Use a hot glue gun to glue them in place. Once finished, all you have left is to decide which door to hang it on. Keep your wreath hanging for as long as you want or change the ribbon for a new look!